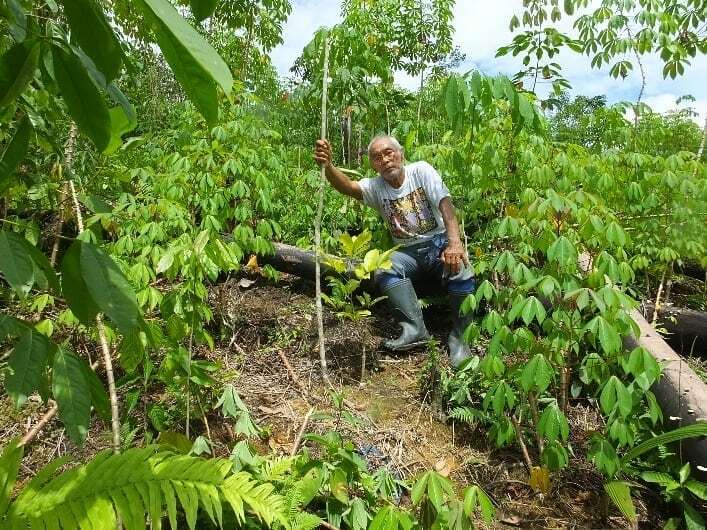 Since 2016 Masarang has supported a fantastic project on West Kalimantan thanks to a donation from a sponsor. We have already reported on this before. sustainable agroforestry, for a better future! The goal of the project is to help local rubber farmers build a sustainable future by helping them find an alternative and sustainable source of income. The farmers, who mainly grow rubber, suffer a lot from the ever-declining rubber price. It is therefore very difficult to earn enough to earn a living, and this is often a reason for farmers to sell their land to, for example, palm oil companies. These farmers form a very important buffer zone between the palm oil plantations and the primary rainforest. When they sell their land, this buffer zone disappears and the road is free for palm oil companies to also convert the primary rainforest into palm oil plantations, with disastrous consequences for biodiversity. The project takes place in the region below, and 7 villages are involved. 5) the seedlings are fertilized. Coordination between the villages is done by Piet Abik’s team. 4. Adrianus Engkuta from Entajak Hamlet in Sepauk Sintang. All of them are volunteers, work for social sense without claiming salary, and they offer farmers support. Visiting the villages is often not easy. In the rainy season the roads change into mud pools, and on a motorbike you are then hours on the road to cross a few kilometers. Furthermore, the roads are often in the most awkward state, which means that the equipment also suffers severely. And there are also other setbacks that must be overcome. For example, there was a major flooding in January-February 2017, causing a number of seedlings to be lost, and participating farmers sometimes also change their minds. In this case, farmers started working in the gold mines. In addition to planting rubber seedlings, the farmers also have to plant other trees, which often involve fruit trees. Farmers plant 50 of this type of trees per project. At the end of 2017, 222 farmers participated in the project, 2500 rubber seedlings were planted, resulting in 24000 rubber trees, and 11750 fruit trees were planted! In total, almost 36,000 trees have been planted. We keep you informed, and thank the team of Piet Abik for their hard work!